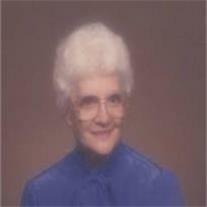 Verdell R. Williams Hodnett, 91 passed away on May 18, 2010 in Mesa, Arizona. Born on May 17, 1919 in Preston, Idaho to James Peter Rassmussen and Sarah Jensen. She grew up in the Preston area until her marriage to her first love and eternal companion, Garth B. Williams, on January 21, 1938. They lived in Idaho, Colorado and Utah until moving to the Phoenix area in 1953. She was a faithful, lifelong member of the Church of Jesus Christ of Latter-day Saints serving in numerous callings including Relief Society President of her ward in Phoenix. She was blessed to develop a strong testimony of the restoration and had a personal relationship with the Savior and Our Heavenly Father. If a family member was in difficulty she was known to set her alarm clock to remind her to pray each hour until the trouble had passed. Verdell was an excellent seamstress, sewing many articles of clothing for those in need. She even designed a ‘Purple People Eater’ costume for a ward roadshow. This costume was similar to Barney the dinosaur now showing on PBS channels. She also sewed many suits, some worn by her sons as they served missions for the church. After the passing of her beloved husband, Garth, she prayed for another companion to share her life and love with. She had impressions of a ‘Man in Blue’ that turned out to be her second husband, William L. (Bill) Hodnett whom she met in the Mesa Temple. He was wearing a blue suit when they met and she knew he was the ‘Man in Blue’ she was looking for. Once again her prayers were answered. Soon they were married and gave each other love and support which extended both their lives . She is survived by her husband Bill Hodnett with whom she lived happily for the last 10 years, her sons James R Williams(Ola Mae), Terry Lorin Williams(Darlene), David Garth Williams(Rachael), Steven R Williams(Mary) and Bruce R Williams(Betty). She has been blessed with a large posterity counting 38 grandchildren and 85 great-grandchildren. She was a wonderful wife, mother and grandmother, she was loved and will be missed by all who knew her. We are comforted knowing that Verdell is with many of her loved ones who have left this mortal life and are rejoicing with her even now. A viewing is scheduled for Tuesday, May 25, 2010 from 6 to 8pm at Bunker’s Garden Chapel, 33 N. Centennial Way, Mesa, Arizona. Funeral Services will be held at the Mesa Kimball East Stake Center, 4640 E. Holmes Ave, Mesa, Arizona on Wednesday, May 26, 2010 at 10am. With a viewing one hour prior to service. Interment to be at the Mesa Cemetery, 1212 N. Center immediately following the service.